WHEN OUR TROOPS SERVE, THEIR FAMILIES ARE SERVING, TOO. IT'S TIME TO DO OUR PART. Joining Forces works hand in hand with the public and private sectors to ensure that service members, veterans, and their families have the tools they need to succeed throughout their lives. Let’s ensure that transitioning service members, veterans, and military spouses are able to connect with career opportunities. Let’s ensure no barriers stand between quality, affordable education and veterans and their families. Let’s work to reduce the tolls that the stress of war, multiple deployments, and frequent moves can take. First Lady Michelle Obama and Redbook team up to help female veterans get jobs. The issue highlights five female veterans who visited the White House to speak with the First Lady about their experiences transitioning into civilian life. First Lady Michelle Obama introduced a video of wounded warrior MSG Cedric King, and celebrates the resilience and strength of our wounded warriors. The First Lady unveils the Administration's Online Veterans Employment Center. This new online platform supports transitioning service members, veterans, and their spouses looking for new career opportunities and helps employers find quality employees. First Lady Michelle Obama sends the Penguins of Madagascar on a top-secret mission to debunk the myths and show the truth about America's returning veterans. Our military service members represent only 1 percent of our population, but they shoulder the responsibility of protecting our entire Nation. Missing birthdays, anniversaries, graduations and so many of the daily moments we spend with the people we love, they make incredible sacrifices. But, they do not make them alone. Explore a map to discover military presences around the country and learn more about our military families and how you can support them. 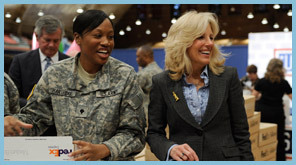 For years, First Lady Michelle Obama and Dr. Jill Biden have met with military families, learned about their successes and challenges, and made it their priority to support them.